After partnering with ThinkCERCA for one year, Bibb County School District achieved double-digit gains on Georgia Milestones. 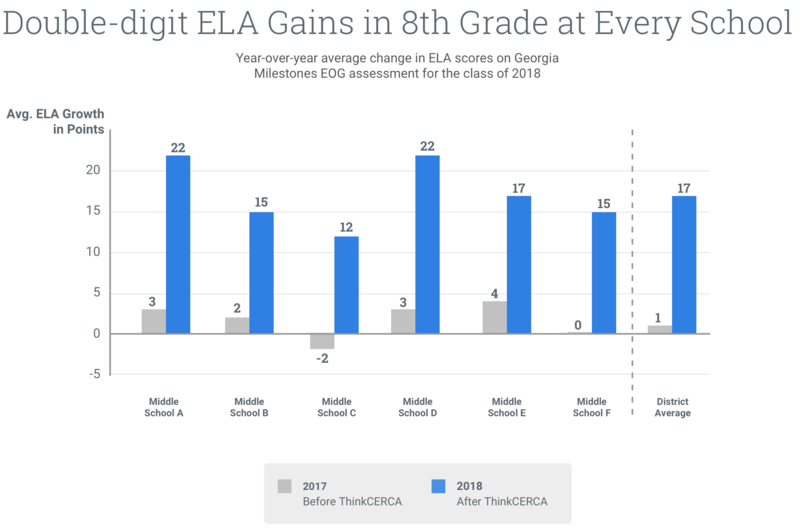 All middle schools saw positive student growth on the English language arts (ELA) portions of the Georgia Milestones end-of-grade (EOG) assessment, which measures depth of knowledge in reading, vocabulary, writing, and language. Among the students who used ThinkCERCA, 22.5 percent moved up one or more achievement levels on the ELA assessment. 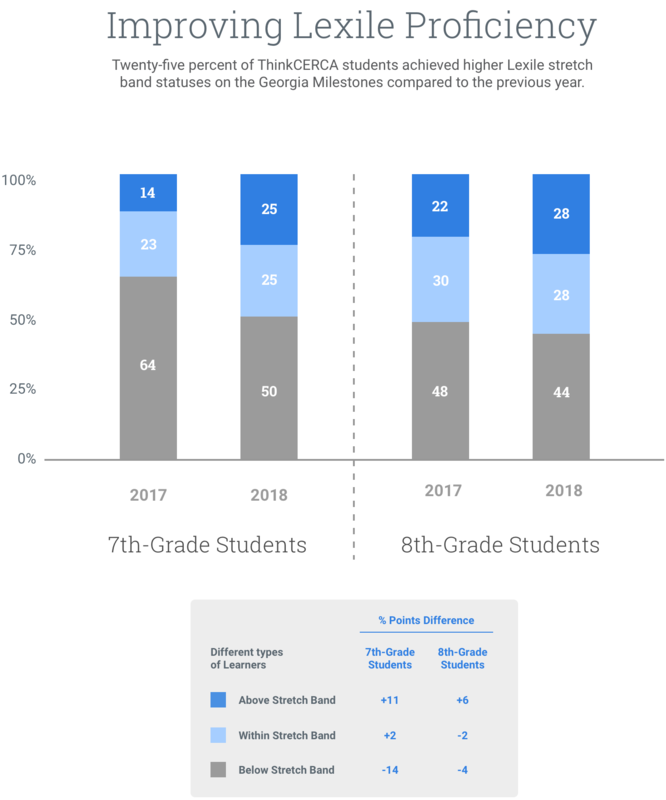 Specifically, 8th-grade students gained an average of 17 points on the Georgia Milestones EOG ELA assessment compared to 1.2 points gained in 2017. Like many school districts today, Bibb County in Georgia knew that their middle school classrooms needed to provide more rigorous literacy instruction to students. By the end of the 2016-17 school year, Bibb County’s middle school ELA growth was nearly stagnant, with 7th-grade students gaining an average of just 1.2 points on the Georgia Milestones ELA assessment compared to the prior year. "We knew we needed to do something differently at the middle school level." After reviewing Georgia Milestones data, the Bibb County team assessed how literacy instruction was being incorporated into regular classroom practice and observed how writing was being taught across the district. Bibb County did do something different. Recognizing the importance of a consistent approach to writing instruction, the district team searched for a solution that could provide students with a common framework for engaging with literacy. It was at this time that they were introduced to the CERCA Literacy Framework, and ThinkCERCA’s curriculum of content-specific literacy lessons. After hearing positive feedback from a former principal of a school that partnered with ThinkCERCA, Bibb County embarked on a three-year strategic partnership with ThinkCERCA. The partnership, launched in the 2017-18 school year, was designed to help middle school teachers deliver rigorous literacy instruction in all core subjects. As a district-wide initiative, strong leadership in the Bibb central office – led by Dr. Curtis Jones, the 2019 National Superintendent of the Year – set the expectation for continuous improvement of writing instruction and performance in every school. The Bibb County district team understood that literacy goes beyond reading comprehension. Literacy encompasses writing, speaking, and listening, and can truly amplify instruction in every subject. By partnering with ThinkCERCA in the summer of 2017, Bibb County made sure that middle school teachers in all core subjects – math, science, social studies, and ELA – had access to expert-designed, content-specific literacy lessons. "ThinkCERCA helped the teachers understand how to effectively implement literacy throughout instruction." Furthermore, ThinkCERCA’s team of literacy professionals provided training and support to help all teachers feel comfortable incorporating writing instruction into their everyday practice. ThinkCERCA’s built-in literacy framework – CERCA – also helped students and educators approach writing in one standard manner across the school district. With CERCA, students understood that they should state a claim, back it up with evidence, explain their reasoning, address counterarguments, and use audience-appropriate language throughout the writing process. The ThinkCERCA team also worked with Bibb County to map out a schedule for when and how teachers could incorporate writing into regular classroom practice. The partners worked with school leaders to analyze data and develop instructional plans for students, as well as coach teachers on literacy best practices, such as how to deliver effective feedback. Bibb County also developed a District Literacy Leadership team to share learnings, observations, and advice on writing instruction. Bibb County recognized that literacy is not a one-year initiative but a multi-year commitment to continuous improvement and rigorous instruction. By establishing processes, holding stakeholders accountable, and targeting areas for growth, the district leadership team ensured that writing became a unified initiative, embedded into instruction and professional development across the middle school community. After committing to rigorous literacy instruction, within one school year Bibb County achieved remarkable growth on the end-of-grade Georgia Milestones state assessment. All six Bibb County middle schools engaged in a ThinkCERCA partnership demonstrated growth on the Georgia Milestones EOG ELA assessment. Among the students who used ThinkCERCA, 22.5 percent moved up one or more attainment levels on the assessment. ThinkCERCA writing lessons completed and teacher feedback provided in the ThinkCERCA platform were important factors for predicting positive student growth on Georgia Milestones. 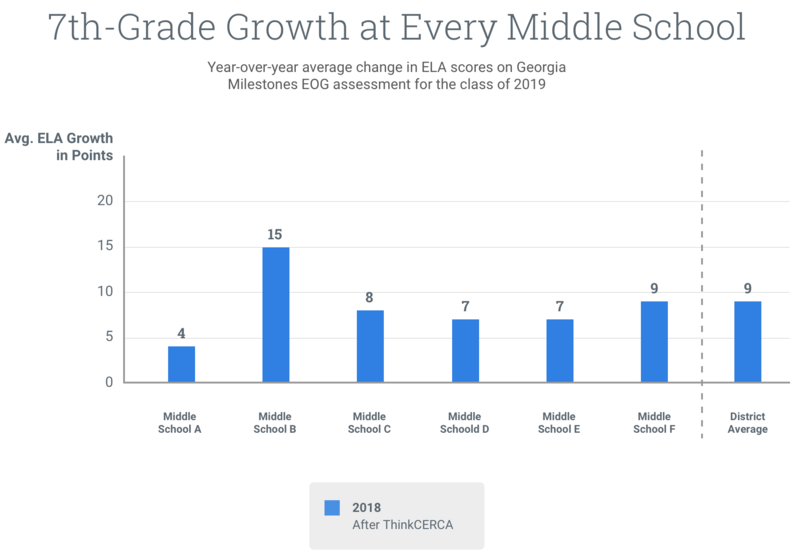 For instance, the analysis determined that for every growth focus a seventh-grade ThinkCERCA student received, their ELA growth increased by 1.48 points. ThinkCERCA’s growth focus feature lets teachers identify and assign an area of growth for students to improve their writing, from organizing ideas to developing conclusions and more. On average, eighth-grade students in all six middle schools saw significant spring-to-spring growth after ThinkCERCA was implemented. 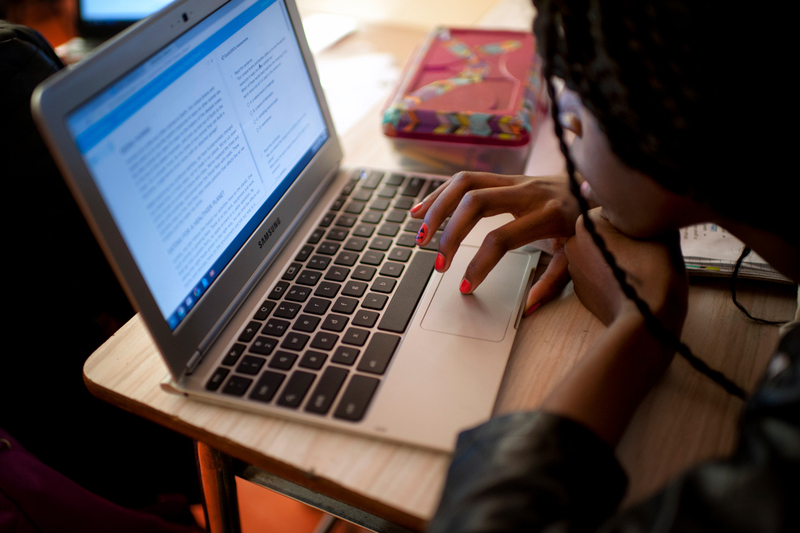 Across Bibb County, eighth-grade students gained an average of 17 points on the Georgia Milestones EOG ELA assessment in 2018. In the prior year, this same cohort of students only gained an average of 1.2 points. 78% of students represented in this visualization were active on ThinkCERCA in the 2017-2018 school year. Similar to the eighth-grade students, seventh-grade students in all schools saw positive growth on the ELA assessment. Across the district, seventh-grade students gained an average of nine points. One school in particular gained an average of 15 points. These gains could not be compared to the 2016-17 growth because fifth-grade data was not available for these students. 78% of students represented in this visualization were active on ThinkCERCA in the 2017-2018 school year. Only one year of growth could be visualized because data prior to 2017 was not available for the class of 2019. Across the district, there was little difference between achievement by gender, with male ThinkCERCA students achieving an average growth of 13.8 points on the EOG ELA assessment and female ThinkCERCA students achieving an average growth of 13.45 points. Additionally, ThinkCERCA students saw significant improvements in reading. Twenty-five percent of ThinkCERCA students achieved higher Lexile stretch band statuses from the 2016-17 school year. On average, students improved their Lexile reading scores by 103.96 points. 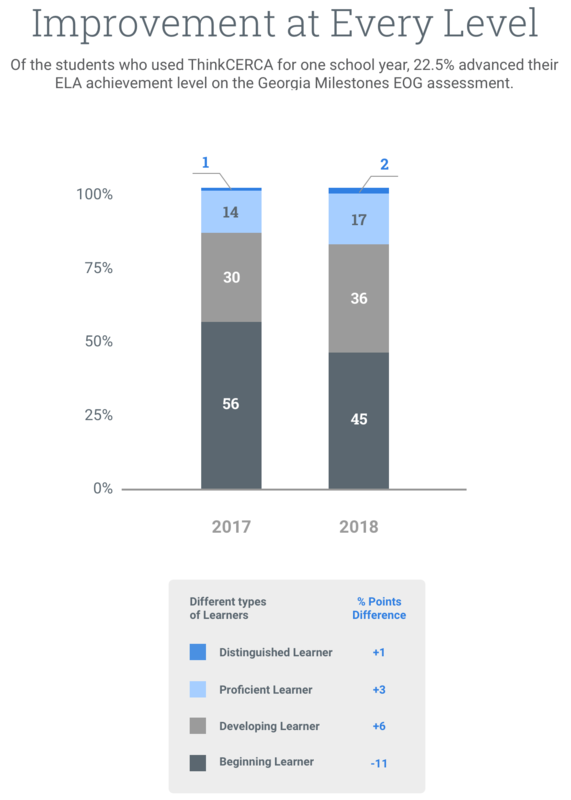 In the Georgia Milestones writing assessment, more ThinkCERCA students were at or above proficiency in the spring of 2018 compared to the spring of 2017 for all of the writing skills assessed. Moreover, students whose writing scores placed them in the lowest writing proficiency level in spring of 2017 saw the most improvement in writing proficiency attainment in spring of 2018. In the fall of 2018, Bibb County began its second year of literacy implementation with ThinkCERCA, aiming to expand usage as part of its goal towards continuous improvement. As part of the second-year initiative, district leadership has emphasized with teachers the importance of incorporating engagement, discussion, and feedback into the writing process. ¹The analysis was performed by Dr. Ugochi Jones, senior data scientist at ThinkCERCA. Dr. Jones earned her Ph.D. in Learning Sciences and Technology Design from Stanford University. ²To be included in the analysis, students must have logged into ThinkCERCA at least one time in the 2017-18 school year. Students also had to have two years’ worth of Georgia Milestones data. Seventy-eight percent of students, or 2,620 students, across the six middle schools met these criteria.